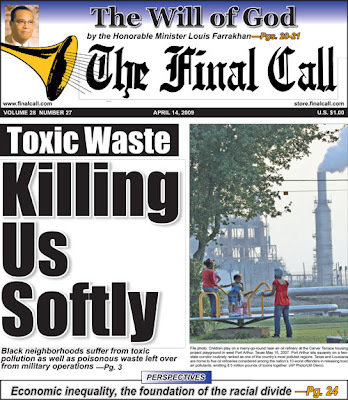 I haven't seen this week's FCN, but that cover is deep. Since you are in Houston, I'd encourge you to check out the book, "The Quest for Environmental Racism" as it talks about the history of dumping in Houston. Plus the brotha Robert Bullard is from Houston too. It's deep because it talks about how dumping evolved in different neighborhoods in 3,4 and 5 wards. Since I'm not from Houston, the hoods they named didn't mean that much to me (besides what Scarface and the Geto Boys taught me ;) ) but i'm sure it'll be significant to you.